We’ve recently discussed the merits of buying either a pre-owned E46 or E90/92 M3. Both are excellent cars which will provide driving enjoyment for years to come. They’re great BMWs. However, a great many people can justify having an M3 as their daily driver. And those two M3s cost too much for the Average Joe to buy them as a second car or weekend toy. 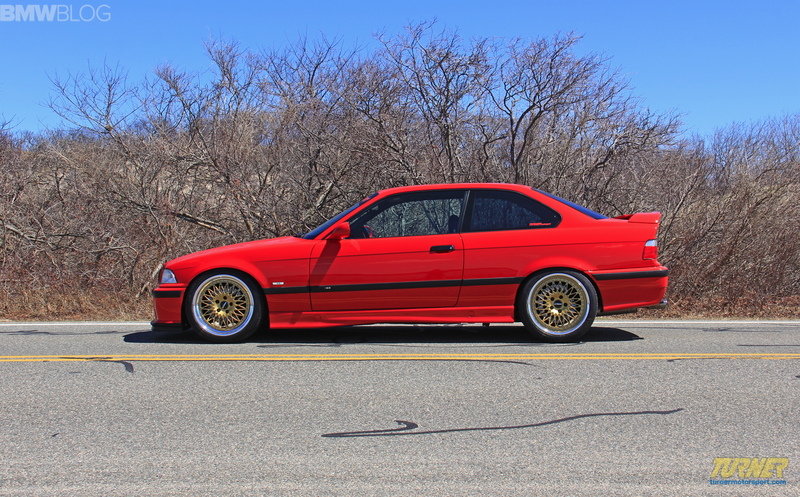 There is a BMW that can more easily be bought for that, though — The E36 M3. Much like the E46 M3, the E36 comes from a time when BMWs were known for incredibly precise and communicative steering and purity of driving. The E36 M3 is a cult hero to many BMW enthusiasts. With a free revving inline-six engine, 5-Speed manual, a limited-slip diff and rear-wheel drive all for under 10k (and in some cases under 5k), the E36 is one helluva deal. So let’s go through a few reasons why someone should buy the E36 M3. This is first and foremost. E36 M3s are so common and so cheap, you can practically get one for a box of gobstoppers and a flirty smile. Because of their age, they’re also cheap to insure, run and fix. It’s the perfect weekend toy because it doesn’t break the bank when something needs fixing or when you want to modify or upgrade. Being that the E36 comes from a time with very little electronics, fixing, modifying and upgrading is very simple. All the parts are mechanical and easy to work on and replace. It’s also one of the more reliable BMWs because of this simplicity. So for a beginner weekend project, the E36 M3 is perfect. While the E36 was never the rocket the E46 was, it’s just as fun. This is because the E36 M3 is lighter and smaller and easier to control, due to its power disadvantage. It won’t light your hair on fire with its performance but it’ll definitely put a grin on your face. Plus, the lower power figure makes it easier to reach its limits. It’s more fun driving a slower car fast than a faster car slow. Also, because it isn’t maddeningly quick, the E36 makes a great track-day car, because it can be handled by mere mortals. This may considered a knock towards the E36 M3 to some, but I consider it a virtue. There are millions of them for sale on Craigslist, eBay and any other car buying site. They are incredibly common. Some people may hate that, but I look at it as opportunity. Because of their availability, not only can you find a good deal on one easily, but parts are readily available and affordable. If something obscure were to break that’s hard to find, just go down to the closest junkyard and it’s likely they have a car you can pull the part from. While the E36 may not be as icy-cool as the E30 and not as good looking as the E46, it’s still a classic. Plus E30s are ridiculously expensive nowadays and E46s aren’t necessarily cheap either. So the E36 M3 offers the most affordable way to get a classic M3. It’s also the oldest M3 that doesn’t cost a fortune. So while you may not get the E30 M3, you’re getting the next best thing, with the E36 M3 and for a fraction of the cost. Because of all of these factors, the E36 M3 makes a great second car or weekend toy, especially if it’s someone’s first of that kind. It’s a great way to get into cars and BMWs specifically. Maybe I’m a bit biased because I have an E36 328i project car myself, but that gives me some credibility as well. It’s such a fun car to work on and drive on the weekends. It’s so pure and devoid of any modern day distractions that it brings you back to a simpler time when cars were about driving above all else. If you’re looking for a second car, take a long serious look at the E36 M3, regardless of your budget. Previous post Is BMW the best at GT cars? Motorsport enthusiasts just don’t realize how utmost satisfying the 90’s BMW M3 sports car really were and still are many years later. The E36 was a solid, uncluttered design. Although I didn’t have the M3 version, my E36 was pretty much bulletproof, which is why I kept it for 18 years. Wow, 18 years. I thought I’ve had mine for a long time, at 8 years. My uncle bought his brand new in 94, after some time, he gave it to his younger brother, then it was passed to me in 2010, we sold it in 2012. Also 18 years but I bet it’s still working! Funny, one of the biggest criticism’s when the E36 M3 was launched was the lack of feel in the steering, this was revised on later cars as a result……..Euro spec E36 M3’s are a whole lot quick than US spec as well due to less strangling of the engine by way of emissions and other rubbish. I can’t vouch for early model M3’s, but my 96 328i has some of the best steering feel I’ve felt. And you’re right about Euro Spec versions. It’s a shame we got the watered down version here in America. I have an E36 328i track car and the steering feels just fine, but I would guess it is partly because I have better than standard geometry up front, not driven the M3 version sadly…..nearly bought one a few times tho. The Euro E36 uses a different engine and Vanos design. Interesting that the 0-60 times are the same on both versions. Or get a 130i for more power from the same very reliable inline 6, in a smaller nimble body for less money. I drive one. It has 96000 mostly trouble free miles. Its fast enough, it handles great and it still feels solid and substantial. I love the looks and it makes me feel good driving it. What more can you want? I’ve had my E36 M3 as a DD, but now it’s a weekender. Great steering. Great car. 5 years with me. The old girl just turned 21. Awesome. That’s the case with my 328i as well. Was my daily, now a weekend car. Had it for 8 years now, and it’s 19 years old. Not an M3, but still fun. Mine will turn 20 in September and is still going strong at 180K miles. Never got tired of it and I don’t think I ever will. Seems like there are a lot of subjectivity put into this. The E36 M3 (S52) was just as fast, or even faster, than the E46. 321bhp and lower weight compared to the heavier 343bhp E46. The E36 also looked way better without its yacht-like side lines and the touring-back design, like every boring new BMW have. Apart from that, great and objective. e36 m3 with s52 is not as fast or faster than e46 m3. nor it has 321hp, that’s for s50b32. Thanks for correction, I’m too used to the Eurospec model. Lots be clear, there aren’t millions of them, they made about 80k worldwide over the production run. I’ve owned mine since new in 1995. We didn’t , (USA) get a watered down model, we got one that BMW could actually sell in numbers that could make a profit. If they had brought the Euro version, it would have cost $55k. Then it couldn’t be made OBD2 compliant. (S50b32). We got a car that is better for how we drive in the US. Anyway, it’s still a great car. My ’99 E36 M3 is an outstanding car and a daily driver. Got an ’06 with 55K miles. Tight handling and a strong and smooth drivetrain with, now, 170K miles. It sets a high bar.